I hope everyone had a nice New Year weekend. We had a lovely time ringing in the new year with friends. Yes, I actually stayed up until midnight! The kids felt so grown up watching the ball drop and sipping sparkling grape juice with their friends. 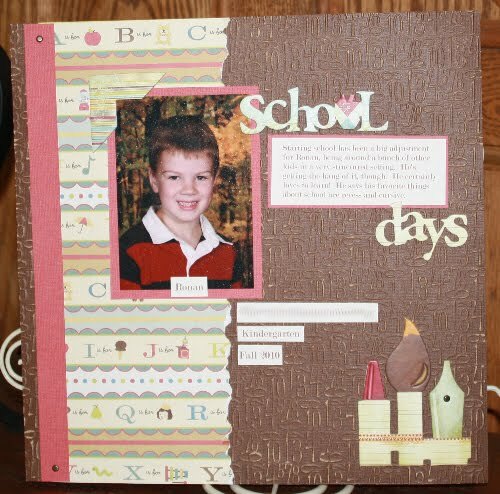 So here is my first papercrafting project of the new year - a layout of my son's kindergarten photo. I received this Core Impressions cardstock for Christmas, and it makes a wonderful background. I sanded it with a wide nail file to bring out the core color a bit. New Year's Eve was so fun! I can be your witness that you did indeed stay up for the new year! In fact, I don't think ANYONE fell asleep this year (including the 2 year old children!). You page is loving and I still hope we can get together an craft some day!